I loved the MB&F Legacy Machine N°1 on sight. Compared to its predecessors it was a tame and docile addition to the portfolio, a nod to traditional pocketwatch construction and a chance for the industry to catch its breath between bulbous-eyed technical sensations. Last November when the results of the Grand Prix d’Horlogerie de Genève were announced the LM1 was awarded not only the prize for Men's Watch, but also the public vote too, thus scooping a very well deserved double accolade for Maximilian Büsser and his Master Watchmaking friends. Just released today are images of Legacy Machine N°2 and I am pleased to report that just like its sibling it is contemporary yet traditional, it is horological history yet it is the future of watchmaking, and it is utterly suberb. The LM1 had twin time zones and one huge stately balance. The Legacy Machine 2 continues the classical equipoise of its predecessor but this time with one white lacquered dial and two balance wheels, thus recreating one of watchmaking's rarities, the dual regulator - which instantly elevates the LM2 beyond the mere realms of desirability and into the domain of the proverbial "grail watch". The eye is immediately drawn to the twin balance wheels and their supporting arches - naturally enough, because they provide a striking panorama but there are also subtleties to be enjoyed too. The top plate of the movement which serves as the main dial has been finely engraved and plated (blued in the case of the platinum edition) and the pristine aesthetic of the white dial is achieved through hours of meticulous hand-lacquering. It is, in fact slightly convex and features curved hands in keeping with the character of this extraordinary piece, everything reaches upward towards the high dome of the sapphire resulting in an exquisite horological curlicue. The attention to detail given to the movement is impressive and representative of historical high grade pocket watch finishing. 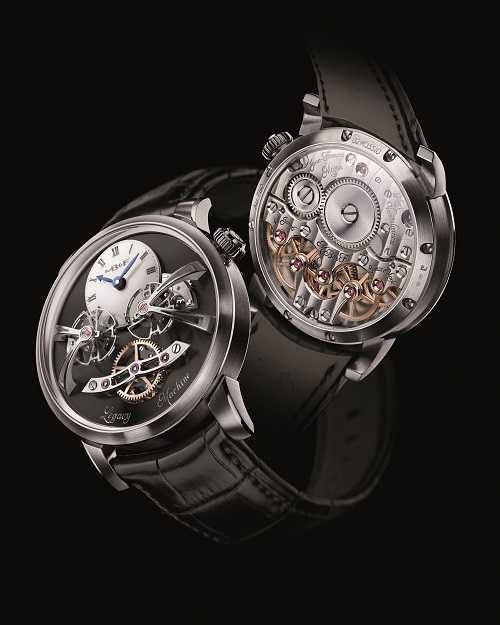 Much consideration has been given to the shape of the bridges, the proportions and the over-size jewels and all provide a link to a watchmaking era which, along with its specialised techniques could so easily have been lost forever were it not for the work of some true vanguards in the industry and the caseback is signed by two of them, Jean-François Mojon and Kari Voutilainen, who both worked on the piece. The manner in which the LM2 pays tribute to 18th Century watchmaking while at the same time combining the skills of contemporary watchmaking is highly commendable and speaks volumes of the affinity which its instigator has with historical horology. 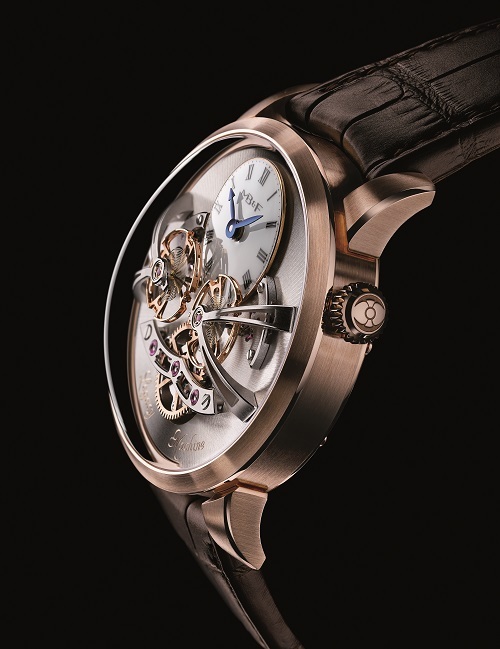 With each new MB&F release, it becomes more apparent - Max Büsser loves watchmaking and watchmaking loves Max Büsser. The MB&F Legacy Machine 2 will be available in 18k red gold and 18k white gold editions and also with a platinum case which will be limited to 18 pieces, more details at the MB&F official website. And a look back at the Legacy Machine N°1. The George Daniels Educational Trust - The Legacy Continues.